Antennas, similar to the ones found perched atop many a TV or radio, work by sending and detecting electromagnetic waves, which are then converted to electrical signals. Antennas are used in applications as diverse as broadcast radio, television, mobile phones, as well as radar and GPS. 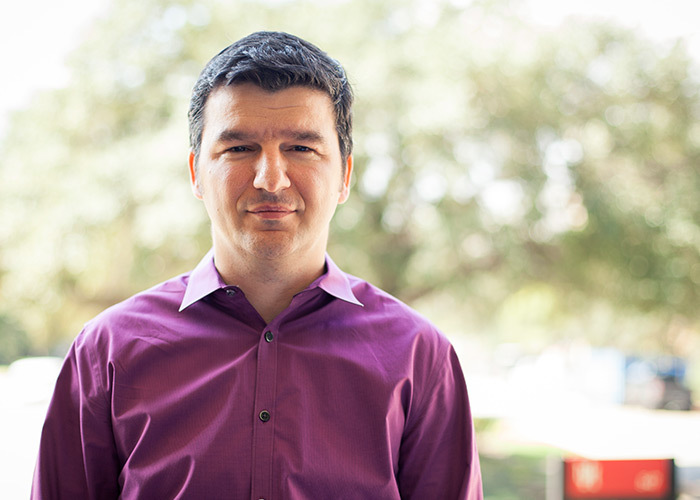 Daniel Onofrei, associate professor of mathematics, develops new applications for antennas.At the University of Houston, associate professor of mathematics Daniel Onofrei is applying his mathematical skills toward developing new applications for antennas. His research is the recipient of a 3-year, $455,000 grant from the Army Research Office. Possible applications of the theory include stealth, covert communications, antenna synthesis and eliminating interference in antenna farms. “Interdisciplinary collaborations can be extremely productive, because the way that a mathematician looks at a problem may be completely different than how a physicist or biologist would look at a problem,” Onofrei said. This research program started in 2013 with an initial project funded by the Air Force Office of Scientific Research through the Young Investigator Award. The initial goal was using electromagnetic waves to cancel out incoming signals, rendering objects invisible to radar. Since its inception, the research program has expanded to include acoustic applications, the mathematical principles of which are similar, although not without their own unique challenges. Applications include noise-cancellation, personal audio sound strategies and protection against sonar systems. The acoustic project is funded by the Office of Navy Research, with an objective of synthesizing sources for the active manipulation of acoustic fields. Results from the initial project were published in peer reviewed journals and conferences and are currently undergoing preliminary testing through the Air Force Office of Scientific Research. The testing is being directed by Air Force antenna specialist Richard Albanese, with assistance from Andrey Chabanov, associate professor of physics at the University of Texas at San Antonio. “This is an example of a research project that started as a theoretical idea of applied science, and now, through an interdisciplinary collaboration, has matured into a product that is being tested,” Onofrei said. This research has received over $1 million in funding from the Army Research Office, the Office of Navy Research, the Air Force Office of Scientific Research, and a UH GEAR grant. David Jackson, professor of electrical and computer engineering, is also a collaborator in this project.